These were the purpose-designed premises of the leading Glasgow photographic firm T. & R. Annan & Sons. As well as a ground-floor showroom and a gallery for art exhibitions, the building included a studio and extensive work rooms and offices. 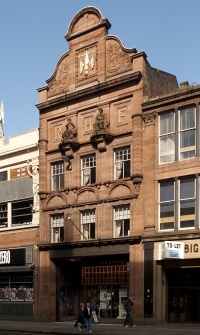 The red sandstone facade to Sauchiehall Street has features derived from 17th-century architecture, most conspicuously an elaborate Dutch gable. It incorporates statues by R. A. McGilvray & Ferris. Authorship: According to the architect W. S. Moyes, who worked in Honeyman, Keppie & Mackintosh's office at this date, the building was designed by John Keppie. There is no evidence that Mackintosh was involved, although there is a drawing of the Sauchiehall Street elevation – different in some respects from the executed design – which is apparently in his hand.